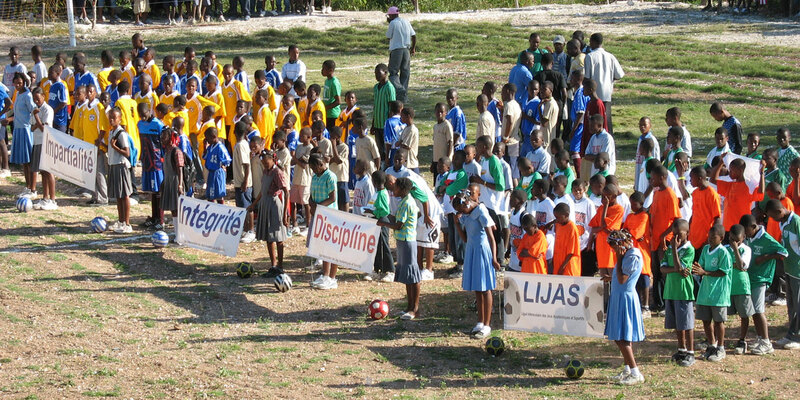 We believe strong communities are the foundation of change in Haiti. We support activities that foster community vitality. HFHF runs a men’s and women’s soccer league in Bainet. We currently have 10 men’s teams and 8 women’s teams that compete in tournaments throughout the year. Students must maintain a certain GPA to play on the team, and participants learn important traits such as leadership, teamwork, and perseverance. Community businesses are also involved in the league, sponsoring tournaments with water, food, radio coverage, and tournament prizes. We seek to build a guest house and business center in Bainet. These initiatives will create jobs within the community, will draw income to Bainet, and will also provide sustainability to Hope for Haiti Foundation through income generation. Without electricity, television, or transportation, Radio Bigot serves as the main form of communication for Bainet. Solar powered radios distributed throughout the community allow families to tune in from their homes. Programming runs from 4 a.m. – 8 p.m. daily and includes sermons, music, health education, public announcements, soccer tournament broadcasts, and words from community leaders. Want to get involved? Donate, take a trip, or volunteer! Contact Jean Eloi for more information.